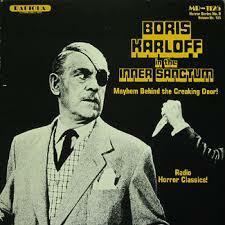 When you think of Boris Karloff, I’m sure visions of the Frankenstein Monster or a mad scientist come to your mind. This time of year, you might even think of the Grinch. But the horror legend was much more than just an actor on stage and screen, he was also an active participant in the theatre of the mind…old time radio. In honor of the anniversary of Mr. Karloff’s birthday tomorrow, let’s take a look and a listen to some of his greatest old time radio programs. Radio was once one of the primary forms of entertainment in the days before everyone had a television, not to mention the internet and cell phones. Every night, families would gather around the radio to listen to comedies and dramas, or the local bar to catch the baseball game. During World War II, it was a vital lifeline to news about how well our boys were doing. And much like the TV stars of today, there were celebrities attached to radio programs that became famous in their own right. Sometimes, it would be the first step in a long career that would expand to the big screen or television. In other cases, established Hollywood stars would stop by and contribute their talents to programs like the Lux Radio Theater or Suspense. And for someone with such a unique voice as Boris, radio seemed like a natural home. Boris made his first appearances on radio as early as 1932 but many of those would be promotional for an upcoming film or a small skit on an ensemble show. But by the late 1930s, as his star was shining bright, he would begin to lend his voice to programs highlighting his status as a horror legend. He would appear on several episodes of Arch Oboler’s Lights Out, including the chilling Cat Wife on April 6, 1938. He was also a frequent star on numerous episodes of Inner Sanctum Mysteries during his time on the stage production of Arsenic and Old Lace. 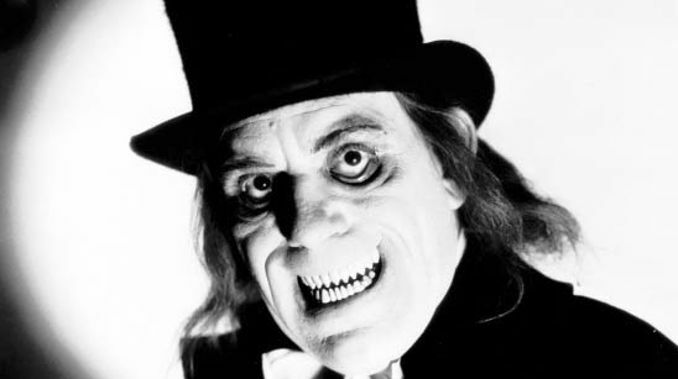 Not all of his appearances were scary as he loved to have fun with such comedians as Jack Benny or Fred Allen, not to mention Edgar Bergen and his friend Charlie McCarthy. 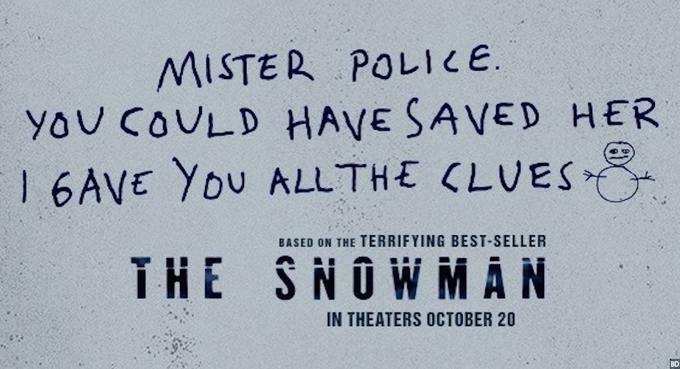 He would pop in for a song with Bing Crosby or talk about sports stories with, of course, a murder theme. It seemed only natural that he have his own show, which happened in 1949 with Starring Boris Karloff. Eventually, Boris would begin to look at television, where he would have numerous guest appearances and several of his own programs, such as The Veil and Thriller. But he wasn’t quite done with radio yet. He would record numerous editions of Tales from the Reader’s Digest that aired from 1959 until after his death. Sadly, many of the radio programs no longer exist. However, many still do and are available to listen to again and again. There are all in the public domain, so you can find them online from numerous sources. To help you get started on your journey, I’ve included some of my favorites below. I hope you enjoy them as old time radio is such a wonderful treasure trove of amazing stories and talent. And when someone like Boris stops by, you know you’re getting treated to a classic. So, on this recognition of Boris Karloff’s day of birth, why don’t we dim the lights and enter the theatre of the mind. Another day and another friend deserves some recognition. Christopher R. Mihm is still celebrating his latest film, Demon with the Atomic Brain, but he’s already setting his sights on 2018. 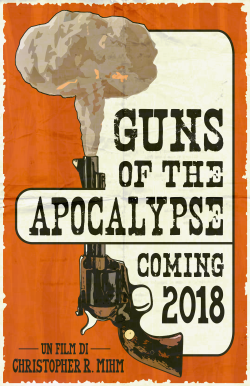 As has become a tradition in recent years, he announced his newest project on Halloween and it is…Guns of the Apocalypse! He describes it as a “post-apocalyptic-spaghetti-midwestern” and this fan is definitely on board! Check out the announcement video at the Saint Euphoria website right now and be sure to read all the details on how you can become a contributor. You can help the movie get made, get your name immortalized on the big screen and get a copy of the film on DVD. And, as always, be sure to tell ‘em Monster Movie Kid sent ya! My good friend and co-host of the Classic Horrors Club Podcast is once again a published writer. The team that brought you Unsung Horrors and We Belong Dead magazine have just released an amazing new book, A Celebration of Peter Cushing, and Jeff has two articles forever immortalized in print. The first is about one of Mr. Cushing’s final film characters, Grand Moff Tarkin from the Star Warsuniverse. The second is on the incredibly fun film, Cash on Demand (1961). 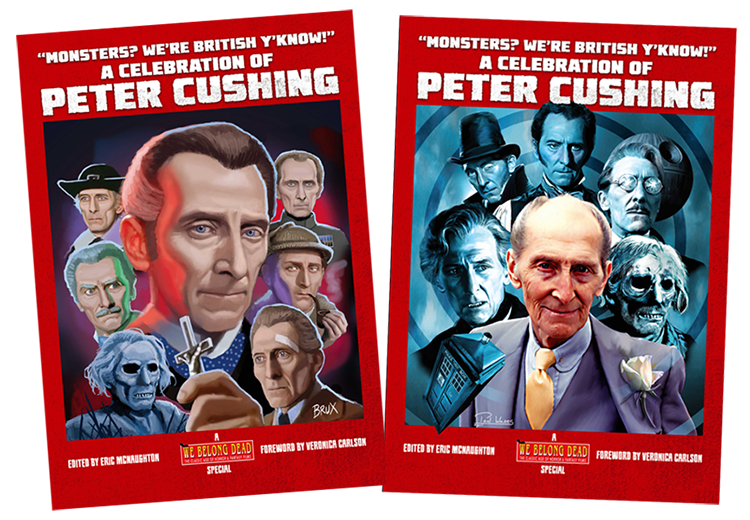 You can purchase your copy of A Celebration of Peter Cushing at their website. It features a foreward from Hammer horror queen Veronica Carlson and looks stunning. Now, the price tag is a little higher but it has my highest recommendation because, at 294 pages, this is a book you want to add to your holiday wish list today! And congratulations Jeff on another great accomplishment! Classic Horrors Club Podcast – If We Only Had a Brain! This month on episode 12 of the Classic Horrors Club Podcast, Jeff and I sit down for a lengthy discussion about brains. 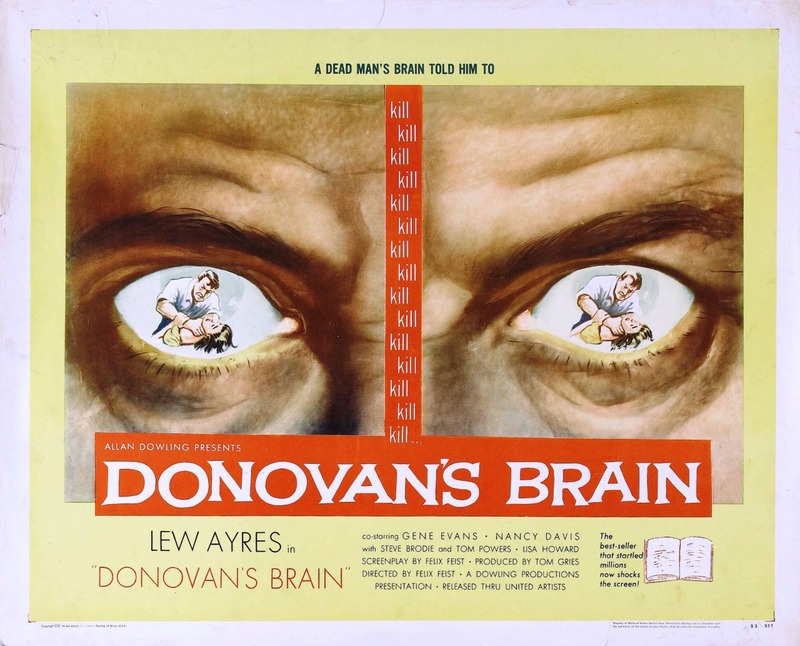 More specifically, the many screen adaptations of Curt Siodmak’s novel, Donovan’s Brain. We talk about the Suspense radio version with Orson Welles, Lady and the Monster (1944), Donovan’s Brain (1953) and The Brain (1962)! Plus, listen for details on an exciting new contest that could put a copy of Demon with the Atomic Brain (2017) in your hands! …and give us some feedback, just like Steve Turek did. The Classic Horrors Club Podcast is a monthly podcast hosted by myself and Jeff Owens (Classic Horrors Club) available through the Phantom Podcast Network! Based in the Kansas state capital of Topeka, the Kansas Silent Film Festival, Inc. has been ensuring the legacy of silent films since 1997. Every February, they gather to celebrate the history of silent cinema in a two-day marathon of celluloid greatness. However, for two decades now, they’ve also been part of a wonderful Halloween tradition, Silents in the Cathedral. This year, I was finally able to attend and it was a wonderful way to get in the spirit of the season. Working with the Shawnee County Public Library and set in the Grace Episcopal Cathedral Church, the beautiful surroundings are perfect for an evening the entire family can enjoy. Now, having never attended and with only a little knowledge based on online pictures, my girlfriend and I loaded up the monster mobile and headed west, ready for a new adventure. My sister was also an eager attendee and we even managed to wrangle my brother-in-law in for the eerie festivities. The church was packed when we arrived, ultimately appearing to be a sold out event. Well, considering it was a free event, the word “sold” isn’t quite appropriate but the church was full with the staff having to add additional seating to accommodate the eager audience. With the screen set up on the altar, it was time for magic to begin. 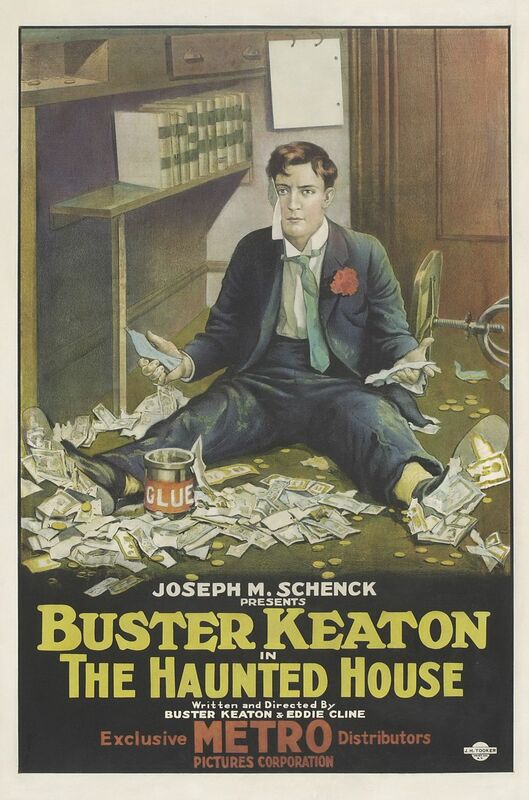 Three short subjects started the evening off, with Buster Keaton’s The Haunted House (1921) setting the comedic pace. A true classic, this is a perfect example of Keaton in his prime. This was followed by a Felix the Cat cartoon and then, another short subject. Now, I grew up watching Our Gang (known to me then as “The Little Rascals”) but my gang consisted of Spanky and Alfalfa. However, this was long before they joined, focusing on the talents of Joe, Farina, Wheezer and others. Saturday’s Lesson (1929) shows the gang being tormented by the devil, who is scaring them into doing chores for their mothers. It’s a classic Our Gang comedy and only the second silent Our Gang short I’ve ever seen. It definitely made me want to see more from this different era. Our main event was the 1922 classic, Nosferatu. This marks the third time I’ve seen it on the big screen and the second with live music accompaniment. As with all of the films this evening, Dr. Marvin Faulwell and Bob Keikeisen provided the music. To say they did an amazing job is an understatement. Having seen them at previous Kansas Silent Film Festivals, I knew we were in for a treat. There truly is nothing better than live music for these wonderful silent films. 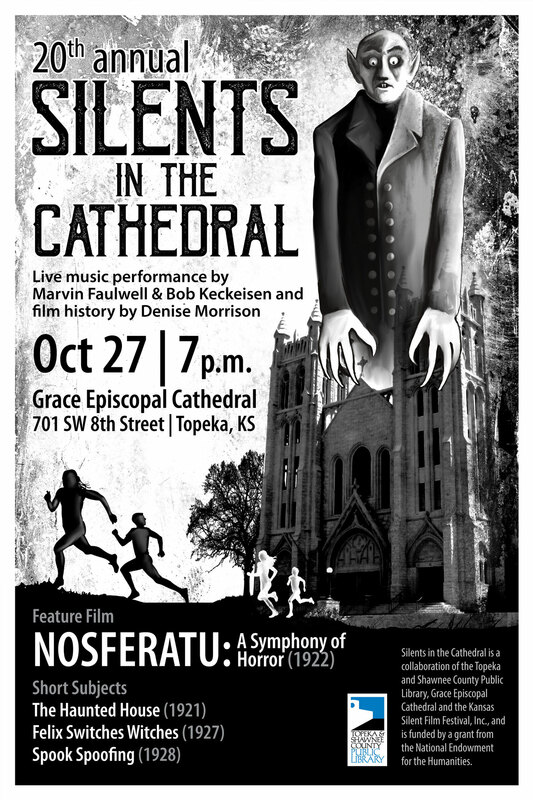 With Nosferatu, the restored print looked majestic in the surroundings of the cathedral. The music was perfect for all of the creepy moments as Count Orlock (Max Shreck) menaces his way in search for precious blood. 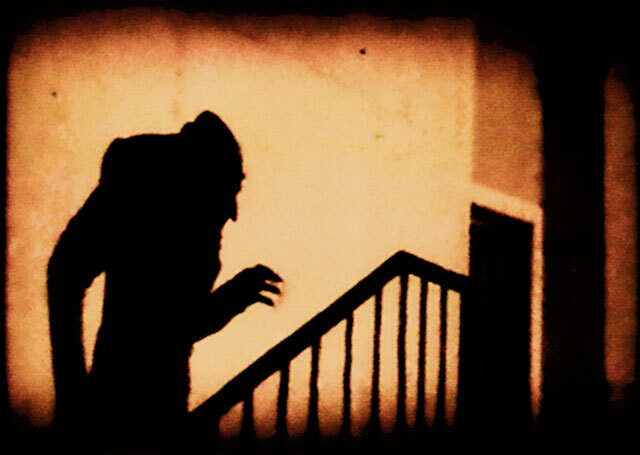 Nosferatu is one of my all-time favorite films and it’s never looked or sounded better. I may be a couple of decades late to the party but Silents in the Cathedral may very well become a new tradition. They had an amazing capacity crowd, which warms my heart knowing so many people love classic cinema, both young and old. You missed out on the 2017 festivities but plan ahead for 2018! And don’t forget that after the holidays are done, the 2018 Kansas Silent Film Festival is right around the corner!